A key facet to any successful business is the ability to generate new clients. In running your HVAC business, however, if yours is like most service-based companies, much of your clientele comes from referrals and word of mouth. While both are excellent traffic sources (which we touch on later), to effectively grow your HVAC company, you’ll need more. A dynamic approach to finding new clients. What you need is a marketing plan. Like other aspects of your business, you must outline how and when you spend your money. Without a marketing guide, it's easy to burn through resources and have no tangible return on your investment. A marketing plan defines how you promote your HVAC business. Made up of two parts - a marketing schedule and marketing budget - the plan quantifies your entire approach to advertising. It includes everything from enhancing your brand to gaining new customers to maintaining your current customers. Housecall Pro automated marketing tool provides small businesses the easiest way to achieve effective marketing. Learn more. The first step in your overall plan is the marketing schedule. It serves to keep you accountable when specific steps require action. The schedule itself can be a stand-alone item or incorporated directly into your marketing budget. Who are you contacting to send out mailers before the busy season? When do you need to renew your annual website hosting fees? What is your timeline for decreasing your online spend for when the season slows down? That's just three straightforward tasks. Your particular schedule will vary, but the goal remains to specify your marketing objectives and know how and when to address them. The other part of your marketing plan is the budget. There is no hard and fast rule about how much you need to apply towards a marketing budget. Generally speaking, anywhere between 3% and 7% of your total sales is a good ballpark for marketing, but plenty of variables will affect that number. Established HVAC businesses merely wanting to increase their exposure may not have to budget as much as a brand new firm trying to gain a foothold in a market. Conversely, if yours is a mid-size service hoping to take the next step in growth or you have plans to expand into new territory, allocation of funds might be a bit different. You’ll want to dedicate enough monies to match the level of advertising necessary to reach those or any other goals you set. Another critical budgeting factor is the location of your business and, of course, seasonality. Add up your current advertising spend per month. Do you have peaks in spend leading up to your busiest months? If not, your advertising spending should roughly reflect the changes in monthly revenue you see during peak months. Your goal should be to get as close to that percentage mix as possible. If you operate in southern climates, you’ve got a longer summer AC season. 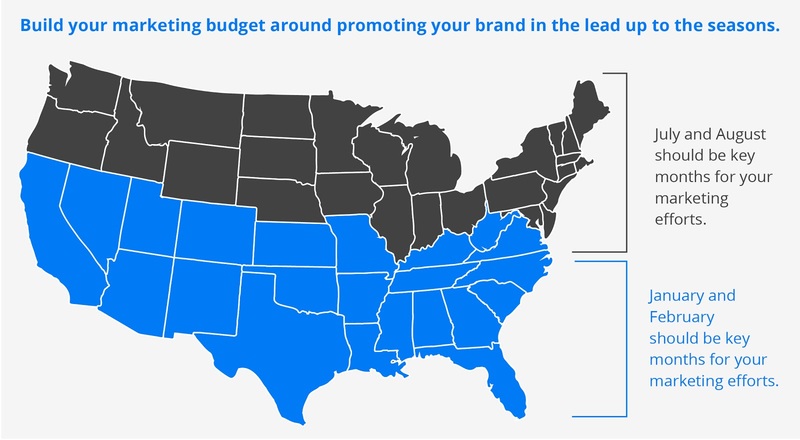 You’ll want to build your marketing budget around promoting your brand in the lead up to the season. In this instance, January and February marketing pushes are necessary to take advantage of springtime preventative maintenance requests. If yours is a northern-based company, the opposite will be true, with the H in HVAC getting more of the focus. July and August should be key months for your marketing efforts. In either scenario, develop your budget with early or off-season specials, preventative maintenance discounts, or no cost estimates for large scale services. Your goal is for potential customers to think about HVAC service at a time they usually would not. 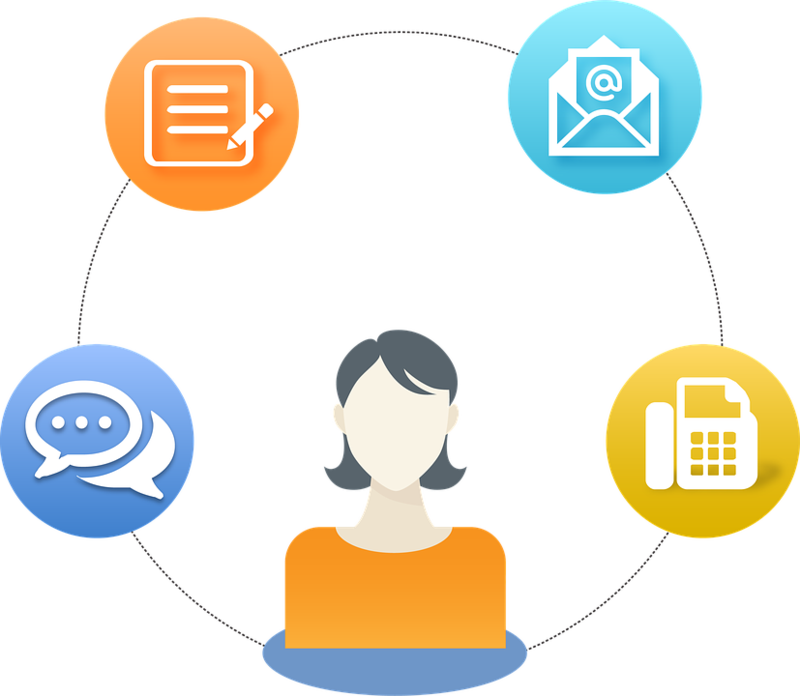 If successful, this initial outreach often translates into repeat customers. Another aspect of your location is more non-seasonal - the condition of the market itself. Not competitive market: are you based where there is little to no surrounding competition? You can probably get away with bare minimum marketing. Very competitive market: if the market is very competitive, expect to spend more dollars to maximize your exposure. Your service area will also dictate the cost of advertising. In general, expect to pay more closer to urban areas. The tradeoff is that more people will see your ads. If you put more focus on online advertising, your costs might be less, but you may also have to allocate them over a greater variety of sources. With that understanding of the marketing plan and its schedule and budget components, let's jump into the specific elements of advertising your HVAC business. You can make the promotion of your brand as simple or as elaborate as you want. However, employing a mix of old-school techniques with more modern approaches will cover a broad mix of potential customers. It's likely this is where much of your previous marketing originated. For good reason too. Offline advertising in the home services industry has proven successful time and again. Although more individuals seeking out and research the firms they do business with online; traditional methods still fill gaps in brand exposure. In some cases, they can even prove more effective than online options. The backbone of almost every home service company is a strong referral program. More so than nearly any other marketing activity, referrals ensure that you always have a reliable stream of new customers from trustworthy sources. Make sure you continue to promote referrals as part of any marketing plan by rewarding current customers who refer new customers and offering discounts to those referrals. It’s low cost and one of the oldest methods to reach a broad swath of people at one time, and it can still prove quite useful. You already have a built-in mailing list with past customers and working with a direct mailing firm will net you new names to target. Make sure that those you direct mail will require your services (such as older neighborhoods instead of brand new subdivisions). 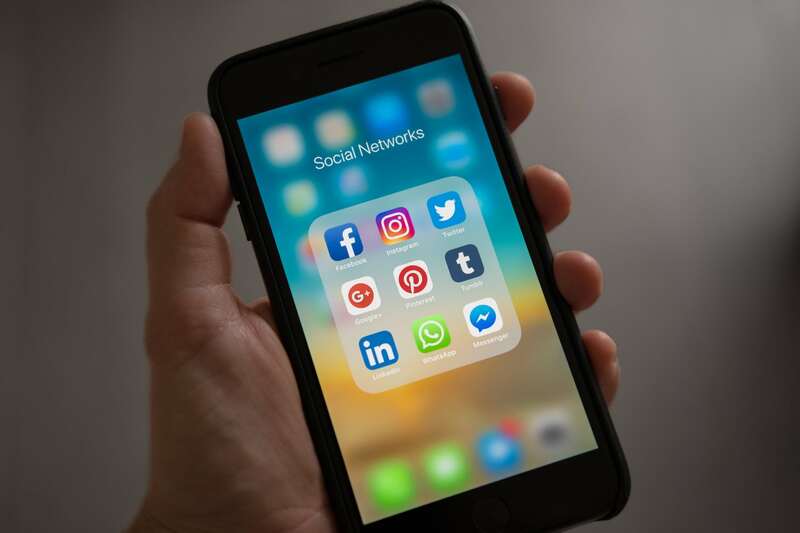 Building connections with influencers who potentially have influence over your target customers is another popular marketing channel today. Regardless of what it’s called, developing relationships with those that can promote your HVAC services to others is critical for your marketing. Examples include community outreach like local sponsorships, offering specials or discounted services to groups with extensive exposure (HOAs, real estate agents, local builders, or property management groups), or donating time or resources to causes (such as Habitat for Humanity). In each case, you raise your brand awareness to others who either have a need for your services or know plenty of others who do. The internet has matured a great deal in the past decade and in that time it has become a massive economic engine - and not just for large national companies. As we noted, people are using online environments to find, research and engage with local businesses, including HVAC companies. An absolute necessity for new service groups, even if you oversee a successful, well-established HVAC service, an online presence will help you maintain and further grow your brand. As few as three to five years ago, a non-retail company website was often nothing more than a static, online billboard - company name, contact info, and some general information about the business. Websites now, however, are interactive showcases. A fully formed site highlights not just your business, but also your expertise with timely and information-rich blog posts and related content, and gives your current and potential customers an opportunity to engage directly with your company. Real-time scheduling, online payment, live chat, access to current specials, and knowledge bases are just a few examples that serve to make your website an ongoing resource for your customers. A well-designed and maintained website will also promote your organic traffic efforts. If someone searches for local HVAC companies in your service area, you stand a greater chance of showing up at the top of Google’s organic search rankings - the pinnacle of online marketing. Learn the easiest yet most effective way to create your own business website with Housecall Pro. Sign up to learn more and get 14-days free trial. Of course, when one thinks of social media, they often think of Facebook. Because of that, its vital that your HVAC business maintains a presence on the service. An additional attribute to Facebook is its powerful advertising platform. If the need arises to get hyper-specific with the type of customers you want to target, Facebook ads are an excellent resource. Of course, costs are involved, as opposed to the basic no-frills business page, but if you want targeted growth or to stand out in a crowded market Facebook ads can prove very successful. The popularity of video is exploding. Whether setting up a YouTube channel (and link back to your website) or post them directly on your site, a video is a powerful piece of content that gives your promotional message life. 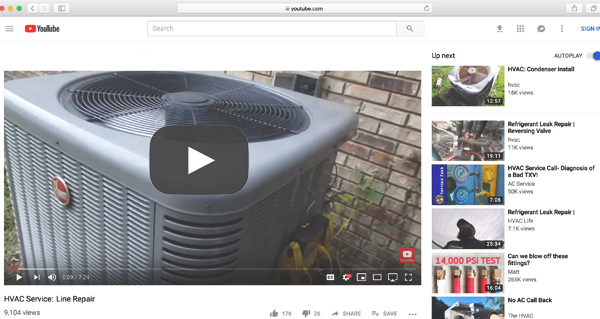 For an HVAC company, video’s might take the form of informative how-tos (like changing a filter) or product demonstrations (like smart thermostats). Your goal is to promote your business while also providing customers tangible (and entertaining) information they can use. Aside from a website and social media, one way to gain wide exposure online is through the use of directories, the modern equivalent of the near-extinct phone book. Websites like Angie’s List, the BBB, Bing, Google, and Yelp allow you to list your business on their sites (at little to no cost with premium options available on several). Linking between these sites and your web pages will also enhance your searchability, particularly when an individual is looking for local businesses. You can gain more customers by allowing them the freedom of booking you directly online and through Yelp. Learn how to enable online booking with Housecall Pro today. Believe it or not, email marketing leans more traditional these days. However, it remains an effective tool before service (seasonal promotions or service reminders) and after service (as follow-up engagement or a general thank you). If you don’t have an email list use your website and phone and in-person engagements to acquire contact information to build it. If you do have a list, make sure you use it. Housecall Pro automated email marketing can save you a ton of time while providing the ultimate customer experience. Learn more and start a 14-day free trial today. When first developing your marketing plan, it makes little difference if your HVAC firm is fresh on the scene or a long-standing business - there will be an element of trial and error before settling on a direction that works best your company. No doubt your company has and will continue to evolve. Your marketing plan is no different. It takes time to determine your top advertising sources and when they work best. It's also important to be patient, test new approaches, and make necessary tweaks until you find the right formula. By developing a marketing plan, you gain greater insight into how to promote your company and the money you’re spending to do so. From that, you’ll learn valuable lessons that over time guarantee you not only reach more potential customers but that you also reach the right potential customers.